DOVER, NJ, July 26, 2018 - Today, Casio announces the retail availability of the latest addition to its men’s G Steel line. 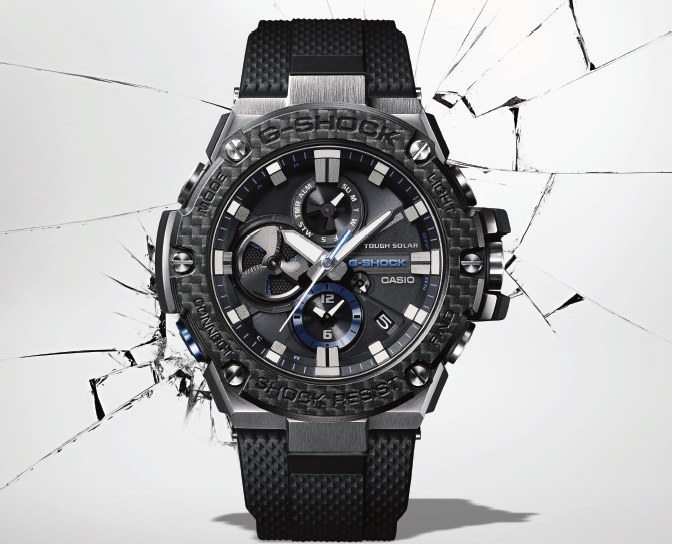 The GSTB100XA-1A, the most recent of G-SHOCK’s connected models, features a carbon bezel, sapphire crystal and two-tone layered band. Announced earlier this year at COUTURE 2018, the GSTB100XA-1A utilizes Bluetooth low energy technology to pair with smart phones via the G-SHOCK Connected App, offering connectivity alongside absolute toughness. Once connected, the user may acquire time information at the press of a button. The result is accurate timekeeping no matter where in the world you happen to be. The sturdy urethane band was produced using a bi-color molding process that makes it possible to decorate the outer surface with a sporty pattern, and blue urethane for the inner surface. A metal band ring reduces the chance of band breakage due to abrasion. Refined blue coloring used for accents on the face combine with the blue of the inner band for a sporty look that embodies G-SHOCK absolute toughness. Furthering its durability is a lightweight, layered carbon bezel which is a combination of state-of-the-art Toray Industries TORAYCA® and NANOALLOY® resulting in outstanding shock resistant characteristics. A highly scratch resistant, clear sapphire glass is used for the crystal to enhance readability and appearance. The GSTB100XA-1A also incorporates tough solar, solar-powered charging capabilities, and employs a super LED light and Neo-Brite luminous hands for maximum visibility.